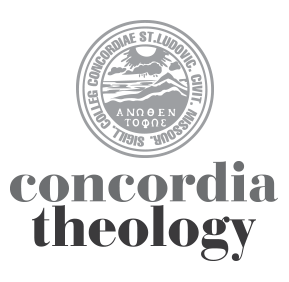 The Departments of Systematic Theology of Concordia Seminary, St Louis, Missouri, and Concordia Theological Seminary, Ft. Wayne, Indiana, in joint meeting offer this paper as a contribution to the continuing discussion in our Synod on the Office of the Holy Ministry. Each of us has his own particular concerns and his own level of discomfort with matters in the Synod, but all of us are concerned that some of our disagreements and confusions are about doctrine. To be sure, there is no disagreement and confusion about what constitute the Lutheran articles of doctrine. There is, however, much disagreement and confusion about how we should embody these articles in our lives, including how we should embody the Lutheran doctrine of the office of the ministry. We recognize that embodying a doctrine or a principle in our lives is much more difficult than merely stating it or agreeing with it. This is the way with the distinction of Law and Gospel. Embracing it is quite simple; learning to do it faithfully is a lifelong venture. This is the way with the Athanasian Creed’s central Trinitarian claim: “We worship one God in three persons and three persons in one God, neither confusing the persons nor dividing the substance.” Confessing it in the liturgy on the festival of the Holy Trinity is straightforward; observing it straightforwardly in our theological reflection often proves difficult. This is the way with the relationship of justification and sanctification. Stating that sanctification follows justification is easy; reflecting their relationship properly in preaching and pastoral care can strain even pastors who have seen it all. This is also the way with the office of the ministry and the life of the church. For instance, it is one thing to confess, “no one should publicly teach, preach, or administer the sacraments without a proper [public] call” (AC XIV). But it is another thing to discern what courses of action properly embody this doctrine when no pastor is available for God’s people, or when considering how seminarians might acquire skill in preaching and teaching, or when a congregation has many shut-ins. Difficult or not, however, discerning faithful ways of embodying our doctrine is just as basic a Christian responsibility as confessing our doctrine. To help us all in this task, we offer the following affirmations. 1. The Scriptures and the Lutheran Confessions locate the office of the holy ministry within God’s plan and work of salvation through Jesus Christ. Jesus said to them again, “Peace be with you. As the Father has sent me, even so I am sending you.” And when he had said this, he breathed on them and said to them, “Receive the Holy Spirit. If you forgive the sins of anyone, they are forgiven; if you withhold forgiveness from anyone, it is withheld” (John 20:21-23). The office of the ministry does not exist simply by virtue of apostolic precedence or for the sake of good order, but by virtue of Christ’s will and for the sake of the salvation of sinners. However, our thinking and conversation—and our practices and policies—should be consistent not only with particular passages in the New Testament (e.g., John 20 and Matt. 28) and the Confessions (e.g., AC V and XIV) but also should be consistent with the ways the Scriptures and the Confessions present and discuss the office. These ways are not hard to determine. The Scriptures and the Lutheran Confessions locate the office of the ministry within God’s plan and work of salvation through Jesus Christ. a. The Scriptures and the Lutheran Confessions locate the doctrine of the office of the holy ministry within the divine economy of salvation. The most basic and familiar way of locating the office of the holy ministry (and therefore the doctrine of the office) is within God’s economy of salvation, i.e., within God’s plan and work of salvation through Jesus Christ. The Lord Jesus Himself does this in the Gospels. These accounts serve as the basis for teaching that Christ Himself instituted and commanded the office, along with all that His institution and command entail. From these accounts we also can discern the scope or the power of the office, namely, “to preach the gospel, to forgive or retain sin, and to administer and distribute the sacraments” (AC XXVIII.5). Therefore, if anyone is in Christ, he is a new creation. The old has passed away; behold, the new has come. All this is from God, who through Christ reconciled us to himself and gave us the ministry of reconciliation; that is, in Christ God was reconciling the world to himself, not counting their trespasses against them, and entrusting to us the message of reconciliation. Therefore, we are ambassadors for Christ, God making his appeal through us. We implore you on behalf of Christ, be reconciled to God. For our sake he made him to be sin who knew no sin, so that in him we might become the righteousness of God. Working together with him, then, we appeal to you not to receive the grace of God in vain. For he says, “In a favorable time I listened to you, and in a day of salvation I have helped you.” Behold, now is the favorable time; behold, now is the day of salvation (2 Cor. 5:17-6:2). The Lutheran Confessions adopt this approach to characterizing the office of the ministry, especially when they establish and delimit the power or authority of those who have been called to the office. In AC/Ap XXVIII, this power is contrasted to the power of civil authorities. In Ap XIII, this power is established against the Roman conception of the priesthood as a sacrificial office on the one hand (Ap XIII.7-9), and against the Enthusiasts who set aside the Word entirely on the other hand (Ap XIII. 11-13). In the Treatise on the Power and Primacy of the Pope, this power is shown to be given equally to all the apostles and to all who succeed them, not principally to Peter and his successors in the Roman church. We can see their concern to show that ministers represent Christ and do His work from their repeated citations of the words of Jesus recorded in Luke’s Gospel: “The one who hears you hears me” (10:16; see AC XXVIII.22; Ap VII/VIII.28, 47; cf. Ap XII.40 and Ap XXVIII.18). b. The Scriptures and the Lutheran Confessions locate the doctrine of the office of the holy ministry within the context of justification by faith in the Gospel. Some of the confessional witnesses already cited point to another significant way to characterize the office of the ministry: within the context of justification by faith in the Gospel. AC V directs us to this context when it connects justification with the means of grace: “To obtain such faith [i.e., faith that ‘God will regard and reckon…as righteousness in his sight’ AC IV.3] God instituted the office of preaching [das Predigtamt], giving the gospel and the sacraments. Through these, as through means, he gives the Holy Spirit who produces faith, where and when he wills, in those who hear the gospel” (AC V.l-2). This article emphasizes that the Holy Spirit gives justifying faith through the means of grace. Furthermore, the understanding that the keys have been given immediately to the church is consistent with this teaching. The Confessions, however, also understand that these means of grace are to be administered publicly only by those who have been properly called. This is asserted plainly in AC XIV: “Concerning church government it is taught that no one should publicly teach, preach, or administer the sacraments without a proper [public] call.” This office of teaching, preaching, and administering the Sacraments is held not simply as a matter of good order, but, as we have already seen, because the office has Christ’s institution and command. As we see in Ap XIII, the Confessions hold together both the emphasis that justification comes through the means of grace and the acknowledgement that God has given the office of the ministry so that these means might be administered and sinners thereby justified. When discussing whether ordination may be understood as a sacrament, the article first distinguishes the evangelical understanding of the office of the ministry as a calling to preach the Gospel and administer the Sacraments from the Roman Catholic conception of a sacrificial office (par. 7-9). But if ordination is rightly understood as having reference to the ministry of the Word, then the Apology has no objection to calling it a Sacrament. Why? Two reasons are given: first, because “the ministry of the Word has the command of God and has magnificent promises like Romans 1[:16]: the gospel ‘is the power of God for salvation to everyone who has faith'” (par. 11); second, because “the church has the mandate to appoint ministers” (par. 12). For Moses writes about the righteousness that is based on the law, that the person who does the commandments shall live by them. But the righteousness based on faith says, “Do not say in your heart, ‘Who will ascend into heaven?”‘ (that is, to bring Christ down) or “Who will descend into the abyss? '” (that is, to bring Christ up from the dead). But what does it say? “The word is near you, in your mouth and in your heart” (that is, the word of faith that we proclaim); because, if you confess with your mouth that Jesus is Lord and believe in your heart that God raised him from the dead, you will be saved. For with the heart one believes and is justified, and with the mouth one confesses is saved. For the Scripture says, “Everyone who believes in him will not be put to shame.” For there is no distinction between Jew and Greek; the same Lord is Lord of all, bestowing his riches on all who call on him. For “everyone who calls on the name of the Lord will be saved” (vv. 5-13). But how are they to call on him in whom they have not believed? And how are they to believe in him of whom they have never heard? And how are they to hear without someone preaching? And how are they to preach unless they are sent? As it is written, “How beautiful are the feet of those who preach good news!” But they have not all obeyed the gospel. For Isaiah says, “Lord, who has believed what he has heard from us?” So faith comes from hearing, and hearing through the word of Christ (vv. 14-17). Jesus Christ means “the end of the law for righteousness.” The way of salvation lies not by hearing and doing the Law, but by hearing and believing the Gospel, and the true righteousness of life comes as a consequence of faith. But, as Paul explains, there is no righteousness of life without faith, no faith without hearing, no hearing without preachers, and no preachers without sending. In this way, Paul locates the ministry of the Word and the office of this ministry within the context of justification by faith in the Gospel. 2. Jesus Christ instituted and commanded the office of the holy ministry to save sinners. As the New Testament teaches and the Lutheran Confessions testify, God has not only established the office of the ministry, but He has established it for a definite purpose. Both ways of characterizing the office of the ministry stress that Christ instituted and commanded the office for a particular purpose, namely, to save. Seen in the context of God’s economy of salvation through Jesus Christ, the office of the holy ministry consists of men appointed and sent by Christ as God His Father had sent Him. Seen in the context of justification by faith, the ministerial office has been established for the justification of sinners through their preaching of the Gospel, their forgiveness of sins, and their administration of Baptism and the Lord’s Supper. Therefore, the fact that the Scriptures and the Confessions locate the office of the holy ministry within God’s plan and work of salvation directs us always to reflect upon and talk about this office in that context. Accordingly, a basic test of any understanding of the office of the ministry is whether it is consistent with God’s plan and work of salvation and with His activity of justification through His means of grace. The testimony of the Lutheran Confessions shows the importance of seeing the saving purpose of the office. The Confessions usually and most significantly discuss the ministry of the Word (i.e., the activity of preaching the Gospel, forgiving sins, and administering the Sacraments) and the ministerial office (i.e., the office responsible for conducting this activity) with the interest that God’s saving work be accomplished. We cite several occasions. One arises in connection with justification by faith. In AC V the ministry of the Word and Sacraments is confessed as given for the working of justifying faith. Another comes in connection with the distinction of the two powers. In AC XXVIII, the evangelicals “have been compelled, for the sake of comforting consciences, to indicate the difference between spiritual and secular power, sword, and authority” (par. 4). When the Confutation misses the point of this article, the Apology answers, “If the opponents would only listen to the complaints of churches and pious hearts! The opponents valiantly defend their own position and wealth. Meanwhile, they neglect the state of the churches, and they do not care if there is correct preaching and proper administration of the sacraments in the churches” (Ap XXVHI.3). A third is seen in the Apology’s discussion of the definition of a “sacrament.” When Ap XIII has “no objection to calling ordination a sacrament,” it is because “the ministry of the Word has the command of God and magnificent promises like Romans 1[:16]: the gospel ‘is the power of God for salvation to everyone who has faith'” (par. 11). A fourth comes when the Treatise challenges papal primacy. Here it stresses, “certainly the church is not built upon the authority of a human being but upon the ministry ofthat confession Peter made, in which he proclaimed Jesus to be the Christ, the Son of God” (par. 25), and it charges that the Roman confusion about the authority of the pope “brought horrible darkness upon the church and afterward precipitated great tumult in Europe. For the ministry of the gospel was neglected” (par. 34). 3. The saving activity for which Christ instituted and commanded the office of the ministry raises the question of “authority” or “power” (nature and scope of authority). Since the fundamental purpose of the office of the ministry is to save sinners, the existence of the office itself will naturally lead to questions and challenges about its authority or power, because salvation is the prerogative of God alone. Ministers in the exercise of their calling perform deeds that God alone has the right and power to perform. By what right do they do such things? In answering this question, it is important to remember not only that Jesus Christ instituted and commanded the office, but also that He Himself is the paradigmatic minister. Acting as the Christ and Son of God, Jesus Himself also prompted questions about and challenges to authority. We see this not only in the particular instance when He forgave the sins of a paralytic (Matt. 9:1-8, where He proved His authority to forgive sins by healing the man), but in His ministry as a whole. Jesus gave signs of His authority: healing the paralytic, telling the Samaritan woman all about her life, being attested to “by God with mighty works and signs that God did through him (Acts 2:22),” and, above all, the sign of Jonah. His saving words and deeds led ultimately to His rejection and crucifixion, but His resurrection from the dead vindicated His identity and authority as the Christ and the Son of God. Christ did not act on His own authority, but according to God’s dispensation and in the power of the Spirit. When Christ instituted and commanded the office, He did so in the same way. He did so because “all authority in heaven and on earth has been given to me” (Matt. 28:18) and in the same way “as the Father has sent me” (John 20:21), and He did so with the gift of the Holy Spirit (Luke 24:49; John 20:22; see also Acts 1:8; 2:1-21). In this way, namely, through Christ’s calling and ordaining, the apostles were given not only the responsibility but also the authority to speak and act in God’s name. Through call and ordination, ministers are given not only the responsibility to speak and act in God’s name, but also the power. 4. The whole church’s possession of the power of the keys relativizes neither the necessity nor the authority of the office of the holy ministry, but it confers to the church both the right and the responsibility to call and ordain ministers. As we noted in the Introduction, the topic of the office of the ministry arises “in discussions about ‘lay ministers,’ mission and evangelism, and the relationship of congregations and their ministers” (248). Looking further into all of these discussions, one frequently finds contentions over the relationship between the church as possessing the power of the keys and the office of the ministry also as possessing this power. These contentions make this relationship an important issue today. The assertion that Christ established the ministerial office is significant because it shows that the authority of the office derives from Christ’s own authority. It is true that Christ places men into the office and conferred this authority through the call of the church, whose right to call and ordain ministers stems from her possession of the keys. Ministers, however, exercise authority by virtue of the office that Christ Himself instituted. When they act according to Christ’s institution, those put into the office act “in the stead and by the command” of Christ and so that those who hear them, hear Christ (cf. Luke 10:16). Ministers do not serve at the pleasure of the congregation, as a servant or an employee, but serve as deputies of Christ. Christ’s institution, however, not only establishes the authority or power of the office but also qualifies it. What Christ established and commanded defines both what is and what is not within the scope of the authority of this office. The Confessions recognize this qualification particularly in AC/Ap XXVIII on the power of bishops, which are concerned to articulate the range of the powers proper to the office. Consequently, according to divine right it is the office of the bishop to preach the gospel, to forgive sin, to judge doctrine and reject doctrine that is contrary to the gospel, and to exclude from the Christian community the ungodly whose ungodly life is manifest—not with human power but with God’s Word alone (AC XXVIII.21). In the Confession we have said what power the gospel grants to bishops. Those who are now bishops do not perform the duties of bishops according to the gospel, even though they may well be bishops according to canonical orders, about which we are not disputing. But we are talking about a bishop according to the gospel. We like the old division of power into the “power of the order” and the “power of jurisdiction.” Therefore, bishops have the power of the order, namely, the ministry of Word and sacraments (ministerium verbi et sacramentorum). They also have the power of jurisdiction, namely, the authority to excommunicate those who are guilty of public offenses or to absolve them if they are repentant and ask for absolution (Ap XXVIII. 12-13). When they act “according to the gospel,” i.e., according to the institution and command of Christ, Christians should hear and obey them. “That is why parishioners and churches owe obedience to bishops, according to this saying of Christ (Luke 10[:16]): ‘Whoever listens to you listens to me'” (AC XXVHI.22). On the other hand, “whenever they teach, institute, or introduce something contrary to the gospel,” they must not be obeyed (AC XXVIII.23). To be sure, those who occupy the office may exercise other kinds of authority, but if they do so, they do so according to human agreements and for the sake of order, not because they have a divinely given right. The assertion that Christ gave the keys to the whole church is significant for at least two reasons. First, this claim is the basis for recognizing that in certain circumstances any Christian might administer God’s grace. Because Christ gave the power of the keys to the whole church, the Confessions recognize situations in which any Christian could convey God’s grace to another Christian brother or sister (Tr 67). One situation is “an emergency,” that is, a situation of imminent danger of death where no pastor is available. In such situations, “even a layperson grants absolution and becomes the minister or pastor of another” (Tr 67). Another situation includes instances when brothers and sisters in Christ deal with one another’s sins and burdens. Such instances include “the secret confession that takes place privately before a single brother or sister” (LC Conf 13) and the “mutual conversation and consolation of brothers and sisters” (SA III.IV). We can see from this that the truth that Christ gave the keys to the Church often does not speak to some questions about evangelism commonly asked today, such as “Are all Christians missionaries?” or “Does the ‘Great Commission’ apply to ministers alone or to all Christians?” or “Can any Christian share the Gospel, or is this only for pastors?” When these questions are dealt with, they usually are referring to speaking about the one true God, His Son, His will, His forgiveness, His love, etc. Both the Old and New Testaments show that the one true God’s identity, actions, and will may be made known by any of God’s people, from the greatest to the least, from Moses and Elijah to the captive girl who lets it be known that the master should visit the prophet in Israel, from John and Paul to the Samaritan woman and the women at the empty tomb. If a slogan like “every Christian is a missionary” refers only to this much, then we should all acknowledge not only that any Christian may speak about God, Christ, judgment, and salvation as they live out their callings, but that Christians as a community in the world do testify to all these things by their very lives. But the fact that Christ has given the keys to the whole church bears on different situations. It addresses situations where it is necessary not simply to speak about God, Christ, and forgiveness but to speak in the name of Christ and actually to forgive. The assertion that Christ gave the keys to the whole church is significant also because it gives to the Church the right and the responsibility to call and ordain ministers. The Confessions never use the truth that the whole church possesses the power of the keys to make the office of the holy ministry unnecessary or merely useful. On the contrary, this truth serves as the basis for the church’s right to call, choose, and ordain ministers. Exercising this right by calling those who are placed in the office is one significant way that the church keeps Christ’s institution and command. The Treatise demonstrates this line of thinking. It acknowledges some difficulties and challenges that churches may face with respect to their ministers. Some churches may be confronted by ministers who abuse their power or lead ungodly lives. Other churches may find ministers unavailable in time of need. These kinds of situations, however, do not lead the Confessors to suggest that Christians might do without men called and ordained to the ministerial office. On the contrary, the fact that the church possesses the keys gives them not only the right but also the obligation to ordain ministers if necessary: “[W]hen bishops either become heretical or are unwilling to ordain, the churches are compelled by divine right to ordain pastors and ministers for themselves” (Tr 72). It might be said that this right holds even in an “emergency” and conclude that such situations do not show that ordination is optional but necessary. But this way of putting the understanding of the Confessions fails to acknowledge that the confessors took this sort of right and responsibility for granted. We can see that the confessors regarded ordination as necessary by the way that the Treatise uses the “emergency” situation in its argument. It was unnecessary for them to prove this; in fact, they could use it as a part of a proof. The Treatise uses it as a premise in order to prove that the church must have the right to choose, call, and ordain ministers. This right is a gift bestowed exclusively on the church, and no human authority can take it away from the church, as Paul testifies to the Ephesians [4:8, 11, 12] when he says: “When he ascended on high…he gave gifts to his people.” Among those gifts belonging to the church he lists pastors and teachers and adds that such are given for serving and building up the body of Christ. Therefore, where the true church is, there must also be the right of choosing and ordaining ministers, just as in an emergency even a layperson grants absolution and becomes the minister or pastor of another. So Augustine tells the story of two Christians in a boat, one of whom baptized the other (a catechumen) and then the latter, having been baptized, absolved the former (Tr 67). In an emergency situation, the fact that the whole church has been given the power of the keys makes ordination appropriate, not irrelevant. Persons who act in such emergencies are not thereby put into the office. Simply because one is thrust into such a situation, or simply because one might possibly be thrust into such a situation, no one should be understood himself as being put into the office. The point is that the Treatise does not imagine churches without ordained ministers of some kind, even in emergency situations or when no one else will call and ordain men for the office. As confessors of the same doctrine, neither should we. 5. We should observe both a clear distinction between aptitude for serving in the office and the authority of those in the office and also a definite relationship between them. The question of aptitude comes up regularly in conversations involving the office of the holy ministry. One argument for the ordination of women is that women are supposed to be more likely to have dispositions suited for pastoral ministry. One concern about non-residential pastoral education programs such as DELTO (Distance Education Leading to Ordination) is that they may not always provide adequate training and formation for pastors. One reason that the category of “teacher of theology” has been recently discussed is that there are women willing and able to teach theology in the Synod’s institutions of higher education. Whether such arguments, concerns, or reasons have validity is a question for another occasion; for our purposes, they illustrate how readily the issue of aptitude enters when a conversation involves the ministerial office. Aptitude is a necessary category for thinking about ministers and their office because they are expected to have certain qualities and capacities and because they are given definite responsibilities to fulfill. For instance, they must be “able to teach” (1 Tim. 3:2). But we should be careful not to let aptitude be the primary category for reflection and discussion of ministers and their office. Knowledge alone is not enough. Skill and wisdom to put knowledge to use are not sufficient. Authority or power to act is also needed. As we have already emphasized, Christ established this office for acts that convey God’s forgiveness and promises of life and salvation. Such acts require not only a certain aptitude, but they require divine authorization, which is given a man when he is called and ordained to the office. Accordingly, authority or power is also a necessary category for reflection on the responsibilities of the office of the ministry and on the expectations for those called to the office. We have already observed that the ministry of Jesus Christ shows that “authority” is a significant concept for the doctrine of the ministry. At this point we would say more specifically that his ministry shows that the concept is significant for thinking about such issues as call and ordination and also education of candidates for the ministry (“pastoral education”) and their certification. First, it shows that “call and ordination” are essential for conduct of the ministry. Ministers do things in the place of Christ. They forgive and retain sins. They judge doctrine. They administer the signs of God’s favor. They warn and admonish against sin and error. They exclude and include particular persons. In all these things they stand over against others, and so the question follows naturally: “By what right? On whose authority?” When Moses went to Pharaoh, he had his staff. When Elijah stood off against the prophets of Baal on Mount Carmel, he could call down fire from the heavens. When Jesus was challenged for a sign, He gave them the sign of Jonah. These indicated their God-given authority. What is the sign of authority for ministers today? It is their call and ordination, which assure that they act by divine right and on the authority of Christ. This truth makes such ideas as “lay ministers” invitations for difficulties and troubles to ministers whose authority is doubtful and to laypersons whose assurance of God’s grace may be questioned. Second, the concept of “authority” is significant for the formation and certification of candidates to the office of the ministry. In short, it defines questions of character and makes them essential. Of course, issues of character for ministers have been much discussed in recent years, and often for good reason. But the relevant issues go beyond the qualities expected broadly of professionals or certain “interpersonal skills.” The requirements of proclaiming the Gospel and judging doctrine require boldness and confidence. Excommunication of manifest sinners and the absolution of the penitent, especially in the face of opposition, require integrity and courage. Staying within the powers granted to the office requires humility and patience. Every level and every kind of pastoral education should seek to instill and encourage these qualities and should lead students to appreciate them, while certification of candidates should pay definite attention to discerning them. Robert Kolb and Timothy J. Wengert, eds., The Book of Concord: The Confessions of the Evangelical Lutheran Church (Minneapolis: Fortress, 2000). All Scripture quotations, except those included in quotations from Kolb-Wengert, which are mostly from the NRSV, are from The Holy Bible, English Standard Version, copyright © 2001 by Crossway Bibles, a division of Good News Publishers. Used by permission. All rights reserved. About the institution and command of the office, see Matthew 28:18-20, Luke 24:44-49, and John 20:21-23. See also John 21:15-17 and Acts 1:8. The article then quotes John 20:21-23 to justify this position. This point is made repeatedly in the Augsburg Confession and the Apology (see especially XIII, as will be discussed in the next paragraph, and XXVIII), and also in the Smalcald Articles (see III.VIII on Confession) and in the Treatise on the Power and Primacy of the Pope (see especially par. 60-61, which address the issue of ecclesiastical power). “Moreover, it must be acknowledged that the keys do not belong to one particular person but to the church, as many clear and irrefutable arguments show. For having spoken of the keys in Matthew 18 [:18], Christ goes on to say: ‘Wherever two or three agree on earth…’ [Matt. 18:19-20]. Thus, he grants the power of the keys principally and without mediation to the church…” (Tr 24; cf. Tr 68) Also see below, §4. It may be helpful to observe further that here the Treatise is retaining the medieval categories of the “power of the order” and the “power of jurisdiction,’, as did the Apology (which the Treatise cites as the evangelicals’ general treatment of ecclesiastical power; see Ap XXVIII. 13-14). But both the Apology and the Treatise appropriated the categories critically, and they removed from their definitions any confusion of the two powers and oriented their definitions for the service of conveying God’s grace. Both the Apology and the Treatise, moreover, criticize Roman Catholic doctrine and practice because they amount to a compromise of justification by grace alone. As significant as it may be, however, it is only one key point of contention. In support of this position, Tr 68 cites the words of Christ, “For where two or three are gathered in my name…” (Matt. 18:20) as pertinent. Again, see also Tr 22-24. Of course, it is a pertinent question to ask whether this witness is faithful, but this, too, is a question for another occasion. Therefore, education, certification, and oversight should neither be relativized as adiaphora nor dismissed as legalistic. Surprisingly, in the discussion, among the affirmations, and even in the Endnotes, there was no mention of the Missouri Synod’s 1851 affirmation and 2001 reaffirmation of C.F.W. Walther’s Die Stimme unserer Kirche in der Frage von Kirche und Amt (The Voice of Our Church Concerning the Question of the Church and the Ministry) as the definitive statement under the Holy Scripture and the Lutheran Confessions of the Synod’s understanding on the subject of Church and Ministry and that all pastors, professors, teachers of the Church and congregations honor and uphold this official position of our Synod on Church and Ministry and teach in accordance with it.